What is the planned timetable? What are some of the high priority aspects of the planned renovation? How will the building's accessibility and environmental performance be improved? How will the building's occupants be affected in the meantime? How will the building’s faculty, staff, and students have input into the plans? Who is the contact for making suggestions or seeking further information? How will the renovations be financed? When can we move back to Burrowes? Burrowes Building, one of Penn State's landmark buildings on the mall, is scheduled for renovation. The building houses the Department of English and the School of Languages and Literatures, which includes almost all of the departments and programs associated with modern languages and their cultures. In total, the academic programs housed in Burrowes Building affect virtually every undergraduate on the University Park campus and many graduate students and faculty as well. 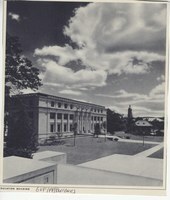 The core of the building was constructed in 1940, with the north and south wings added in 1967. Its basic utilities, such as its electrical writing and the system for heating, ventilation, and air conditioning, need a major update in order to improve their functioning and bring them into compliance with current expectations for energy use. Parts of the building also need an interior redesign for greater efficiency in the use of the building's spaces and improved access for persons with disabilities. Planning for the renovations is underway and this site will be adding new information as it becomes available. In May, 2012, the Board of Trustees included Burrowes Building among renovation projects on the University Park campus, and the architectural firm of BLT Architects was appointed to work with Penn State personnel in getting the design work underway (http://live.psu.edu/story/59606). Beginning in the summer of 2012, architects and engineers and other specialists have worked with two planning committees, one a steering committee that includes representatives of the dean's office and administrators from departments located in Burrowes Building, the other a Burrowes faculty/staff advisory committee. All Burrowes faculty and staff were invited to hear a progress report in February 2013. Faculty and staff were moved from the building at the end of 2013. Construction began in January 2014 with projected completion in December 2015. The exterior of the building will keep its historic façade and general appearance. Updates to the electrical and HVAC systems, so that all parts of the building will have air conditioning and an adequate electrical supply, are to be given high priority, along with creating increased usable spaces for offices, and related purposes such as shared workspaces (labs, meeting rooms), by redesigning some of the interior spaces for better efficiency. For example, some of the larger offices will be made into smaller single offices, and walls that now consist only of movable panels, which transmit too much sound between offices, will be replaced by standard walls. The building now has a lot of staircases, reflecting its history of having been built in segments, and the designers are looking for ways to reduce their number or footprint. Design changes are planned to create better continuity and improved traffic flows, including for individuals with disabilities, between the center of the building and the wings, where the levels of the floors do not match. The present system of elevators and interior ramps will be reconsidered. The new systems and redesign of the building will meet at least the minimum requirements for LEED certification. This attests that the building meets modern standards for sustainability We hope that it will exceed the minimum to reach the silver or gold standard. Of course it will also meet Americans for Disability Act standards. During the construction, between December 2013 and December 2015, the administrative offices of the Burrowes departments have been moved to Ritenour. Most faculty and graduate students are located downtown, with a few in Keller building. For specific locations of individuals, see the official university directory. Planning was done by the steering committee working with the office of Physical Plant personnel and the architects and engineers. Steering committee members include Steve Dotts, Nicole Dress, Carey Eckhardt, Ron Filippelli, Chris Hort, Deb Howard, Mark Morrisson, Chad Spackman, Susan Welch, and Dave Zehngut. The faculty and staff advisory committee was consulted during the project and there were two open meetings where all Burrowes faculty and staff were invited to attend. At Penn State, capital construction funding is separate from the operations budget. Capital construction is funded by a block capital construction grant of $40 million annually from the state, a small fraction of tuition revenue, and borrowing through bond issuance. When can we move back into Burrowes? Current plans call for moving back in at the end of fall semester, 2015. As of August, 2015, the work is on schedule to do that.